"Very delicious and easy to make. Garnish with chocolate curls made by using a cheese grater on semisweet chocolate." Preheat oven to 350 degrees F (175 degrees C). Line two 8-inch round pans with parchment paper. Sift 1 1/2 cups of the white sugar, flour, cocoa powder, baking soda, and salt together in a bowl. Beat shortening and remaining 1/2 cup white sugar together in a large bowl with an electric mixer until light and fluffy. Beat 1 egg at a time into the shortening mixture; add vanilla extract with last egg. Add portions of flour mixture alternately with buttermilk, beating after each addition to form a smooth batter. Pour batter into prepared baking pans. Bake in preheated oven until a toothpick inserted into the center comes out clean, 35 to 40 minutes. Cool in the pans for 10 minutes before removing to cool completely on a wire rack. Remove parchment from cake bottoms. Cut each layer in half horizontally, making 4 layers total. Pour 2 tablespoons cherry liqueur over each cake half. Beat cream in a chilled glass or metal bowl with an electric mixer until stiff peaks form. Beat in 2 tablespoons cherry liqueur and 1/2 teaspoon vanilla extract. Beat in confectioners' sugar and salt until cream filling is smooth and stiff. 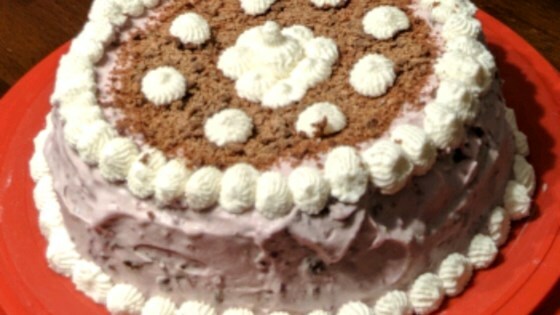 Spread 1 cake layer with 1/4 of the cream filling; top with 1/3 cherries. Repeat with 2 additional layers. Place 4th layer on top; frost top and sides of cake with remaining cream filling. See how to make a classic dark chocolate and cherry cake. Cooking spray (such as Pam®) can be used in place of parchment paper, if desired. Cherry pie filling can be substituted for the canned cherries, if desired. Liquid from the canned cherries can be substituted for the cherry liqueur, if desired. Create more layers for the cake by slicing each round into thirds or even quarters for a fancier cake.